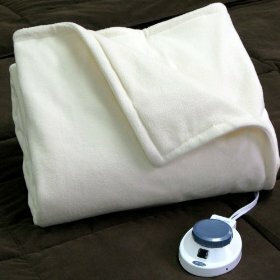 An electric blanket is a great way to save on heating costs during those cold winter nights. Why heat the entire house when an affordable electric blanket can keep you toasty warm instead? Here are some of the things to consider when buying an electric blanket. Design: The type of blanket you choose is solely up to you. They come in all shapes and sizes with a myriad of features. If you have back problems, a mattress pad type might be just right for you. These go under the sheets and keep the bed itself warm. Another great way to save energy is to get an electric blanket that has an auto shut off feature. Once you drift off to sleep it turns itself off saving even more on energy costs. Another great feature is temperature control. Better model electric blankets will have a thermostat that allows you to control just how toasty you want to be. These are just a few things to consider when purchasing your new electric blanket. Whatever your choice you’ll be snuggled up warm and cozy on those long winter nights, and saving money on heating bills at the same time. reminds one of a cloud—soft, fluffy and a dream to have around. It appears to offer just the right temperature to those who have had unsatisfactory experiences with other types of electric blanket. This seems to be due to the wide range of temperature settings – there are ten different levels, allowing for anyone to find the right comfort zone. Reviewers weighed in from all over the country- from Florida, saying they had needed a blanket for those occasional nippy nights; to Upper Michigan, where it hits the negative single digits on a regular basis. This blanket seemed to work equally well no matter what the weather. 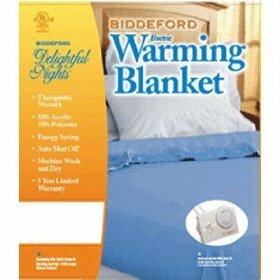 Many consumers stated they appreciated the cords on the Biddeford Heated Electric Blanket, as they are longer than many other electric blankets making it was easier to find the controllers in the middle of the night when they were looking for them. If desired, the cords can be taken out of the blanket for more versatility, especially for those who choose to use it in warmer climates. Several said they do this in the summer, and keep the blanket on their bed. Most of those reviewed said they found no need to set the controller higher than a four or five, and that the blanket kept them perfectly warm. None of the ratings was below a four for this product; those reviewed had nothing but positive comments and said they would recommend the product to others. The Sunbeam Dynasty Retreat Quilted Fleece Pattern Heated Blanket is quite unique in that it has a pre-warm function so it can warm up cold sheets before you get into bed. Plus it has a smart-sense control which allows it to sense the temperature in the room and adjust accordingly so you won’t overheat overnight. The digital back lit display allows you to see the display during the night so you won’t need to ever guess what the current setting might be or have to turn on the light to adjust the setting. There are an amazing 10 setting levels on this blanket so you can adjust the temperature to suit your preference. As a safety feature the blanket has an auto-shut of after 10 hours. This also helps to save on energy costs if you happen to leave it on accidentally. The blanket is made from a 100% polyester blend in a quilted fleece pattern and is machine washable. The Sunbeam heated blanket comes in a variety of colors including olive, raisin, lagoon and seashell and is available in full, king, queen and twin. There’s nothing like snuggling up in front of the TV with a nice soft blanket on a cold winters night. What would be even better is if the blanket was heated. Well with the Soft Heat Electric Warming Blanket you can have just that. This blanket is considered to be one of the safest warming blankets on the market today. What it actually does is convert 12 volts AC into less than 14-18 volts DC. Its called the Safe-n-Warm System and ensures that you kept safe when using the blanket. The blanket is made from a soft polyester and the heat within the blanket is generated by the use of micro wires which are woven throughout the blanket. They are so fine that they are virtually undetectable. Amazingly enough, the blanket is fully machine washable and is dryer safe. The blankets heat up in about 15 minutes and as an added safety feature will turn off automatically after 10 hours. It has an amazing 11 heat settings. The blanket comes in a variety of colors including beige, slate, natural, chocolate and garnet. Sizes include Queen, King, Full and Twin. 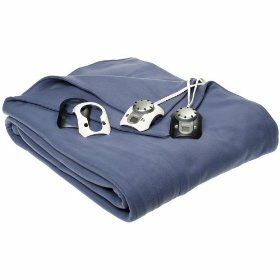 This rigorous testing means that you can be confident about using this low-voltage, machine-washable blanket that combines both safety and comfort which doesn’t have any of the stiff, bulky wires that are common in many traditional electric blankets. The Best Queen Sized Electric Blanket can safely be machine washed and dried. The Hammacher Schlemmer Institute found that the blanket showed no visible signs of piling or loose threads even after having been subjected to multiple laundering cycles. The power converter uses 25 volts or less (most use 120 volts), making this is a safe blanket to use. The wires are almost undetectable under the soft, hypoallergenic 100% fleece cover which means that the blanket makes for a comfortable sleep. Both the queen and the king sized electric blankets have large, easy to read, dual controllers which automatically shut off after 10 hours. Where Can I Buy the Best Queen Sized Electric Blanket?